Hunting for a job is never an easy task at all. Any individual who has a fair bit of experience in the business world would know that you have to be very careful when making decisions pertaining to your career, lest you may find yourself taking a decision which you may regret at a later point in time. If you are someone who is fresh out of college and you are looking for your first full time job, then given here are some tips which can help you in your first full-time job search. Things will certainly be challenging but give it your 100% no matter what. No matter how eager or even desperate you may be, to get a job for yourself you must remember that things in big offices do not work as per your plans. Once you have done your bit by sending in your application along with a copy of your resume, all that you can do is wait to be contacted. Ensure that you make use of a proper as well as reliable medium to send in your documents, just so that they do not get misplaced or land up in the wrong hands. Recruitment is usually a very long drawn out procedure so ensure that you do not get yourself restless. Getting a full time job is not as easy as you might think. So do not expect to be hired to the first company you apply to. In order to avoid too much of disappointment you should apply to as many good companies as you can. This way you are sure to hear from at least a few of these companies. There is simply no point in being too picky and stuck up when searching for your first full time job. Keep in mind that the more experience you have the better it is for you, so even if the first job you get isn’t your ideal pick, just go with the flow and try to take things as they come. There are indeed a number of success stories in the business world. Those individuals, who have started from the bottom and slowly made their way to the top, appreciate all that they have a great deal. So when you are on your first full time job search one tip which you should always remember is that starting from the bottom is not a very bad thing. It is a great way to help you learn things. Once you have acquitted yourself with things at the grass root level then over time, things will become much easier for you to deal with. Do not expect things in the business world to be easy and simple. Before sending your resume to any company it is very important that you do background check on the company. If you are someone who is on your first full time job search, you must keep in mind that your safety is something which comes above everything else. Would you really want to have a job in a company where employees are mistreated or where there is work place violence? In order to avoid getting yourself into any problems and complications, it is important that you do your own homework. Once you know it is a safe place to work then you can go ahead with things in a proper manner. In today’s times all of us browse the internet for atleast a couple of hours a day. If you are someone who is searching for a job, then you should ensure that you make the most of the resources which are at your disposal. Make use of your computer, laptop or even your phone in order to check company websites to see if there are any positions which need to be filled in immediately. In addition to this you should constantly be checking your inbox to check whether anyone has responded to the mails which you have sent out. If you do not check your mail regularly a good employment opportunity may slip through your fingers. Along the way there will be many people who will tell you that when searching for a job you need not act vulnerable, but sometimes, asking around is a very good option indeed, the more you get the word out the better it will be for you. Word of mouth travels very fast indeed, so you never know when someone might be looking to hire an employee just like you. So get the word out that you are searching for a job, there is simply no harm in doing so. What many people do not know is that even today a large number of companies prefer to publish their vacancies rather than putting it up on their company website. Maintaining a company website isn’t easy nor is it cheap and that is why the information you see on the websites might often be outdated. To really help you be informed, while on your job search it is very important to regularly check the newspaper to see whether there is anything interesting for you. You never know what you might stumble upon, so do make it a point to take this extra effort. This period of your first full time job search will indeed try your patience and endurance a great deal, so at such a trying time, a great tip to help you brave all odds, is for you to get a mentor who can talk you through such tough situations. He is likely to have been through the same things and that is why he will probably know exactly what to say to you when you are down. Ensure that the person you choose as your mentor is someone who you can trust and will not try and lead you in the wrong direction. Many young and naïve people make the mistake of trusting the wrong people at easy points in their career. Your first full time job search is likely to drain you physically mentally as well as emotionally so no matter how low you are feeling at no point in time should you think of giving up hope. If you give up hope then all your education and all you have ever planned for will be all in vein. Big things are never achieved with ease, so be willing to dream big and work hard to achieve your dreams. Having hope is something which can really give you a sense of purpose, so do not let others make you second guess your own abilities. Since this is your first full time job search, you must realize that all kinds of rumors are constantly circulated all around the place. Rather than blindly following or listening to what others have to say, it is advisable that you verify every bit of information which comes your way. Believe it or not, no one in the business world is your friend, so the faster you acknowledge this, the better things will be for you. This tip is something which can help you steer clear of a lot of unnecessary trouble and problems. Verifying things don’t take long so just be willing to go that extra mile. No matter how badly your first full time job search is going, you should be willing to put your all into it. The harder you try the better results you will receive. Searching for jobs has never been an easy task for anybody, so do not expect it to be easy for you. Do not be shy of letting go of your inhibitions. Be willing to really pull out all the stops in order to make all your dreams a reality for yourself. Being fearless is something that will help you to get ahead at the onset of your career as well as in the time to come. Having pre conceived notions about what kind of job you are looking for is something that could really ruin things for you. Rather than planning out everything you want on your own, be a little open and receptive to both change as well as experience. Once you broaden your horizons you might find that something which you never thought could interest you a great deal. Things will surely improve with time for you, so just be a good listener and do not expect the moon when you are searching for a job for yourself. Having a negative mindset will never get you very far especially when it comes to the business world. Just because this is your first full time job search, that does not mean that you have the right to go about things in an unprofessional manner. Once the word goes out that you are someone who is unable to conduct himself in a proper manner, then no company is going to hire you at all. Once your reputation is tarnished even a little, clearing your name proves to be tough and often even impossible. So think twice before saying or doing anything in the corporate world. You can never tell how your words may be twisted to mean something else. As mentioned above getting a mentor is something which could be of invaluable help to you during your first full time job search, but along with that if you find that things are getting simply too much to deal with, you can always seek help from a professional. Career counselors will know exactly how to help you at such a time. In addition to that you should be open with your friends and family as their words of encouragement could really be of a great help to you. Even if they do not know what you are going through they will surely try their best to be supportive of you. Finally on your fist full time job search, you need to know that selling yourself short is certainly not the way to go. If you feel that the job description is simply too demanding and the salary or perks are just not good enough then maybe you could give it a pass. Learning to say is also a big part of your development as an individual, so at all points in time learn to see the positive side of things. As long as you are happy with what you are doing you should not let anything bring you down or make you feel like you are not good enough. Trying to remain a proper and relevant part of today’s business world is no easy task at all. There are many people who get crushed under the pressure and are unable to survive for a long time in the business world. If you are someone who wishes to make it big in the corporate jungle then right from the very onset you should try to prove your worth. Take every decision very carefully and ensure that you do not let others make the decision for you. 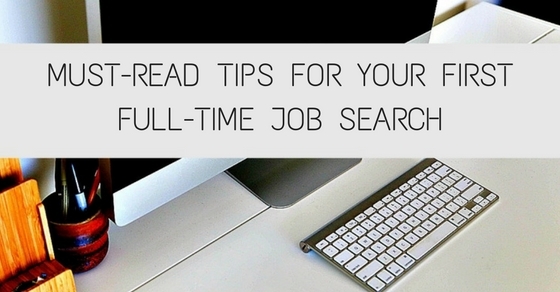 Implement these tips when you are on your first full time job search and you will have absolutely no trouble at all. Next articleHow to Work Under Intense Pressure and Succeed?